Jim Barfield’s 12-year search for the Temple utensils revealed an unexpected discovery to an Oklahoma Noahide: a powerful spiritual connection between the mountaintop Temple in Jerusalem and at Qumran, located near to the deepest spot on the planet. Just as Jerusalem was a city for priests to serve in the Temple, Barfield argues that Qumran was a center for prophecy. Barfield, a retired criminal investigator for the Oklahoma Fire Department and a Noahide, believes he has deciphered an ancient riddle revealing the hiding places of the gold and silver implements of the Temple. Barfield has spent the last 12 years studying ancient maps in his quest to unravel the Copper Scroll. Discovered in 1952 as part of the trove of ancient Dead Sea Scrolls, the Copper Scroll describes 64 locations where gold and silver from the Second Temple were hidden away before the Temple was destroyed. Barfield believes the Copper Scroll points to spots inside a compound that stood in Qumran in Temple times. Some archaeologists surmised the site was a community of Essenes, an austere sect of Judaism ,flourished from the 2nd century BCE to the 1st century CE. In the course of his research, Barfield spent countless hours staring at maps of Qumran. At one point, his research turned him toward the Temple. 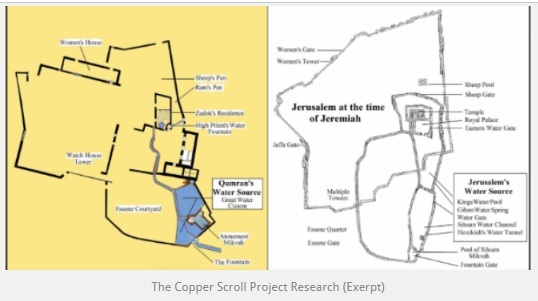 Believing the prophet Jeremiah played a key role in hiding the treasures, Barfield printed out a map of Jerusalem as it appeared in the times of the prophet. Something about the map piqued his curiosity but he couldn’t quite put his finger on it. As a helicopter pilot for the U.S. Army, Barfield was intimately familiar with maps. Gazing at the map of Jerusalem, he suddenly saw something entirely unexpected. “Why did they put Qumran upside down?” he thought. He flipped the map of Jerusalem around and indeed, just as his pilot’s instincts had told him, it was identical with the map of Qumran. In a strange confluence Barfield refers to as “Qumrusalem.” Continue Reading….